Dodd, Lynley. The Apple Tree. Illustrated by author. Gareth Stevens, 1985. Two children spend the year anticipating the fruit their apple tree will bear, only to have a wily thief upset their plans. Hall, Zoe. The Apple Pie Tree. Illustrated by Shari Halpern. Blue Sky, 1996. Describes an apple tree as it grows leaves and flowers and then produces its fruit, while in its branches robins make a nest, lay eggs, and raise a family. Hutchins, Pat. Ten Red Apples. Illustrated by author. Greenwillow, 2000. Marzollo, Jean. I am an Apple. Illustrated by Judith Moffat. Scholastic, 1997. Depicts a bud on an apple tree as it grows into an apple, ripens, is harvested, and provides seeds as a promise for the future. Rockwell, Anne F. Apples and Pumpkins. Illustrated by Lizzy Rockwell. Macmillan, 1989. Wellington, Monica. Apple Farmer Annie. Illustrated by author. Dutton, 2001. This could also be used as a name tag activity. Chorus should be chanted between each verse. With young children you might have them either clap their hands or slap their legs when you chant "apple, apple" instead of both. Repeat with four, three, two and one. And gave it just to me. I have a visual that I made by drawing a tree on a piece of foam core board (shown above). Cut 5 green apples out of construction paper. On the back side of one apple, glue a worm also cut from construction paper. In addition, make 4 apple cores. Laminate the apples and cores. 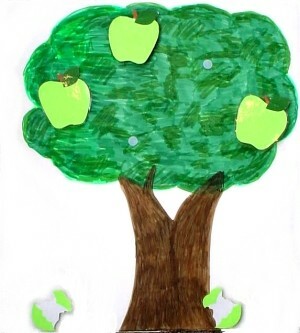 (patterns are below) Put 5 pieces of Velcro® on the leafy part of the tree for the apples and 4 pieces at the bottom of the tree for the cores. Remove an apple and after the line about eating it, put up the apple core. Save the apple with the worm for the last verse. Cut out an irregular shape for the top of the tree and a trunk for each child. Purchase apple stamps or make your own. We cut out apple stamps from flat sponge material using an apple punch. Glue the stamp to the top of an empty film canister or similar container. Have the children glue the tree pieces to construction paper. Put a thin layer of very red paint in a pie plate. Let the children stamp apples on their tree and around the base. * The "Apples" activity and "Applesauce chant," which were written by Susan M. Dailey, can be used freely in programs, but may not be re-posted, reproduced, or sold without prior permission.